Nesting Box in Chapel-St-Leonards sleeps 2 people. Nesting Box is in a peaceful rural setting just ¾ mile from the glorious sandy beach at Chapel-St-Leonards; this beautiful, detached cottage offers a superb base for holidays at any time of year. It has commanding views over pastureland and is adjacent to the owner’s small farm. Nesting Box in Chapel-St-Leonards boasts a good quality of contemporary decor and benefits from a large widescreen TV. The cottage enjoys its own lawned garden with a private hot tub. A traditional beach hut is available at Chapel-St-Leonards beach by prior arrangement with the owner at £10 per day. Fantasy Island theme park is only 3 miles and the Sealife Centre at lively Skegness is 7 miles. Locally, there are nature reserves for bird and seal watching as well as opportunities for horse riding and cycling on quiet country lanes. Lincoln’s lovely medieval streets and designer shops, and the vintage emporiums of charming market towns in the Wolds are also easily accessible. Golf 5 miles. The shop, pub and restaurant are ½ mile from Nesting Box in Chapel-St-Leonards. Living area: With 42 Freeview TV, CD player and French doors leading to garden. Bedroom: With king-size bed, TV and French doors leading to garden. Gas underfloor central heating, electricity, bed linen, towels and Wi-Fi included. Welcome pack. Lawned garden with large patio and garden furniture. Hot tub. Bike store. Private parking for 2 cars. No smoking. Holidays at Nesting Box run from Friday to Friday. Pets allowed at Nesting Box. For a better idea of where Nesting Box is, you can see Nesting Box on the map below. Nesting Box is in Lincolnshire; should you be on the lookout for a special offer, you can find all the special offers in Lincolnshire. It's always worth checking to see what is on offer at the moment. 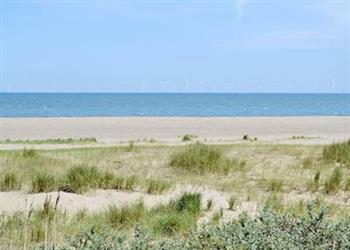 Do you want to holiday near Nesting Box (UKC498), you can see other cottages within 25 miles of Nesting Box; have a look to find your perfect holiday location.